Originally, “panache” was a French word referring to a plume on a military helmet. The famous French monarch Henry IV was fond of wearing a white plume on his helmet whenever he fought in battle, and he even told his soldiers that they should “follow his panache” on the battlefield. Cyrano alludes to this famous story in Act 4, when the Count de Guiche—evidently, someone without much panache—claims that he wears a white scarf to demonstrate his high rank, and yet he takes off the scarf in battle for fear of making himself into a target. Cyrano de Bergerac then reveals that he’s taken the Count’s scarf and worn it himself. In Cyrano, the white scarf (or plume)—originally a symbol of awed obedience to one’s social superiors—transforms into a symbol of social subversion, flamboyant disobedience to authority, and a reckless bravery that also advertises its own recklessness: in short, Rostand’s updated, 19th century version of panache. Where does Cyrano’s panache—the one quality of which he’s most proud—come from? Cyrano doesn’t conceal the fact that Cyrano is insecure about his physical appearance: i.e., his big nose. Surrounded by bullies who tease him for his face, Cyrano compensates (and arguably overcompensates) by perfecting the arts of dueling, arguing, and verbally besting his enemies. When the Viscount Valvert lobs a minor insult at Cyrano, Cyrano responds by challenging Valvert to a duel on the spot, during which Cyrano composes a ballad insulting Valvert. Evidently, Cyrano has had a lifetime of practice—the crowd whispers that Cyrano attacks anyone who insults him. But Cyrano’s panache is less petty and personal than mere insecurity—panache also represents a proud and often brave way for him to live his life. Cyrano refuses to apologize for his ugly appearance, and indeed flaunts his large nose as part of his persona, jumping on any reference to his nose as a chance to display his verbal and dueling skills. Instead of giving in to society’s insults, Cyrano celebrates his physical and intellectual talents in the grandest way imaginable. One could say that panache is a way of attaining freedom: freedom from social expectations of obedience, as well as from one’s own insecurities. In the end, however, Cyrano’s panache has dire consequences. He makes so many enemies in his city that by Act 5, he can barely get through a day without having to defend himself. An unknown enemy attacks him by dropping a heavy piece of wood on his head, injuring and ultimately killing him. Still, the fact that Cyrano’s panache comes back to haunt him doesn’t necessarily mean that it is a negative trait. On the contrary, Cyrano’s death lends panache a kind of nobility. Cyrano’s dying word is “panache”—evidently, he has no regrets for the way he’s lived his life. Like so much else that is noble and beautiful in Cyrano (love, for example), panache doesn’t last very long in real life. And yet even though Cyrano, dies, the idea of panache lives on forever: in Cyrano’s reputation, his friends’ memories of his heroic deeds, and in the play itself. This is the heroic tradeoff that Cyrano, and any other exemplar of panache, must make: the tragedy of a short life, but also the glory of an everlasting reputation. The ThemeTracker below shows where, and to what degree, the theme of Panache appears in each scene of Cyrano De Bergerac. Click or tap on any chapter to read its Summary & Analysis. 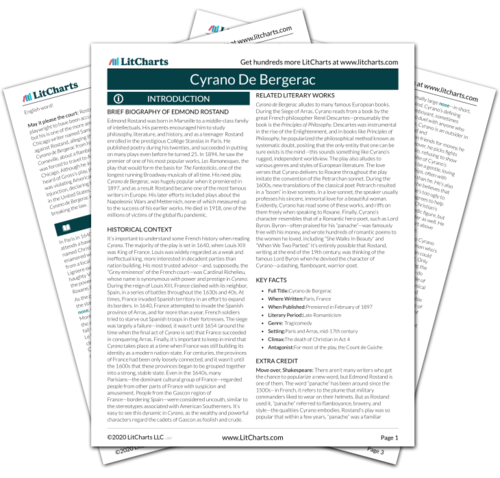 Below you will find the important quotes in Cyrano De Bergerac related to the theme of Panache. Arn, Jackson. "Cyrano De Bergerac Themes: Panache." LitCharts. LitCharts LLC, 21 Mar 2016. Web. 20 Apr 2019. Arn, Jackson. "Cyrano De Bergerac Themes: Panache." LitCharts LLC, March 21, 2016. 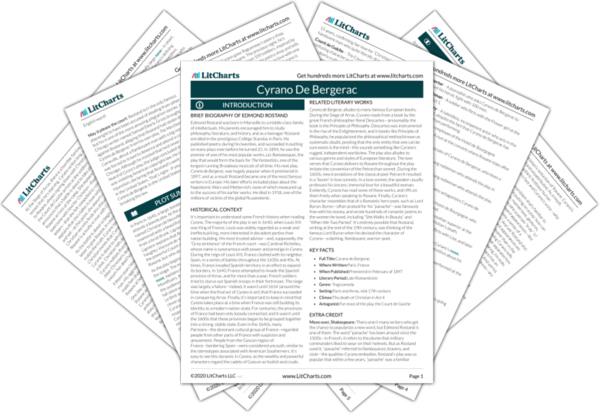 Retrieved April 20, 2019. https://www.litcharts.com/lit/cyrano-de-bergerac/themes/panache.